Following BLM modes are supported by MBSEQ. You can switch between the modes by holding the SHIFT button while pressing an "extra column" button. Note Layer: each 16x16 row will play a different note. The 16 notes per column are pre-selected based on the current scale (MENU+FX->Scale) to increase the octave range, and to simplify the entry of harmonic notes. Important: one note per step can be selected if the track only contains a single note layer (default). By adding more note layers in the MENU+Event page it's possible to select multiple notes per step for polyphonic sequences. Any other parameter layer such as velocity/length/CC/PitchBender/Roll/Probability/etc. : each 16x16 column works like a VU meter. Drum Tracks: each 16x16 row is assigned to a different note (drum instrument) as configured in the MENU+Event page. Hint: instead of drums you could also play a synth. Since each note can be predefined, you are able to create your own "scale" this way. Extra Column: selects the track that should be edited. Push the button twice to mute/unmute a track. Extra Row: selects the step view. Increase the track length to play more step views. Use loop mode or the section function to play only a single step view. Track mode: displays a 16 step view of all tracks. 16x16 buttons: set/clear a trigger. Extra Column: selects a track. Push the button twice to mute/unmute a track. Pattern mode: displays the patterns of all 4 groups. Extra Row: no function yet. Planned future enhancements: pressing SHIFT+16x16 button should select the pattern synchronized to measure independent from the global "synch-to-measure" function. Keyboard mode: allows to play notes of the selected track "live". 16x16 buttons: each 16x16 column will play a different note. Than higher the row, than higher the velocity of the played note. The 16 notes per column are pre-selected based on the current scale (MENU+FX->Scale) to increase the octave range, and to simplify the entry of harmonic notes. Planned future enhancements: pressing SHIFT+16x16 button should play&hold a note until the same column is selected again. Support for playing notes on drum tracks. Keyboard Track mode: all 16 tracks can be played "live" with only a single velocity value. Will be nice for quick soundchecks. Loop mode: all 16 tracks are displayed like in "Track" mode. By pressing one button the last step can be defined (restart at first step once this step has been reached). By pressing two buttons the sequencer will loop between the steps. 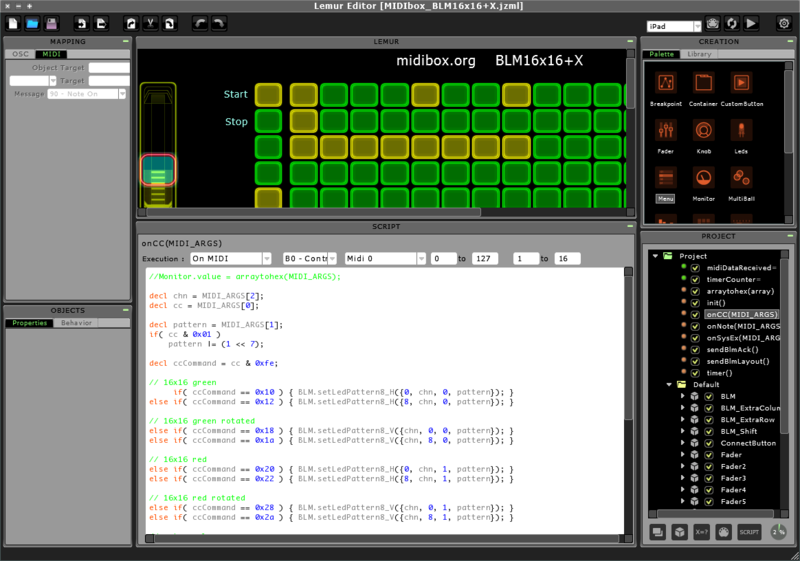 The MIDIbox BLM firmware is running on a MBHP_CORE module, and communicates with MIDIbox SEQ via MIDI. It's possible to add a third MIDI IN/OUT pair to the MBHP_CORE_STM32 resp. MBHP_CORE_LPC17 module so that the original two IO ports can still be used for other connections. No special configuration has to be done in the MBSEQ_HW.V4 file. Please don't be confused about BLM_* and BLM8x8_* parameters. BLM_* parameters configure the (expired) 4x16 BLM which was provided by MBSEQ V3 but isn't so powerful as BLM16x16+X. BLM8x8_* parameters configure a special matrix for Wilba's Frontpanel to save some shift registers. Once selected, MIDIbox SEQ V4 will start an auto-detection at this MIDI port and configure the BLM16x16+X firmware remotely. Sidenote: the term "BLM_SCALAR" is sometimes used instead of BLM16x16+X to highlight the scalability of the hardware concept - in future different BLM dimensions could be provided, MBSEQ V4 is prepared for detecting the size w/o the need for additional configurations. Important: the BLM modes are normaly selected with the SHIFT button. Since it isn't possible to select two button functions with a mouse (if you don't own a touchscreen...), the SHIFT function can alternatively be activated with the space key of your computer keyboard. /Update: since v1.1 the shift button functions are selectable (and displayed) with a second extra column at the left side of the BLM. After I got my first experiences with Lemur for iPad I must say that this software is really a master piece! 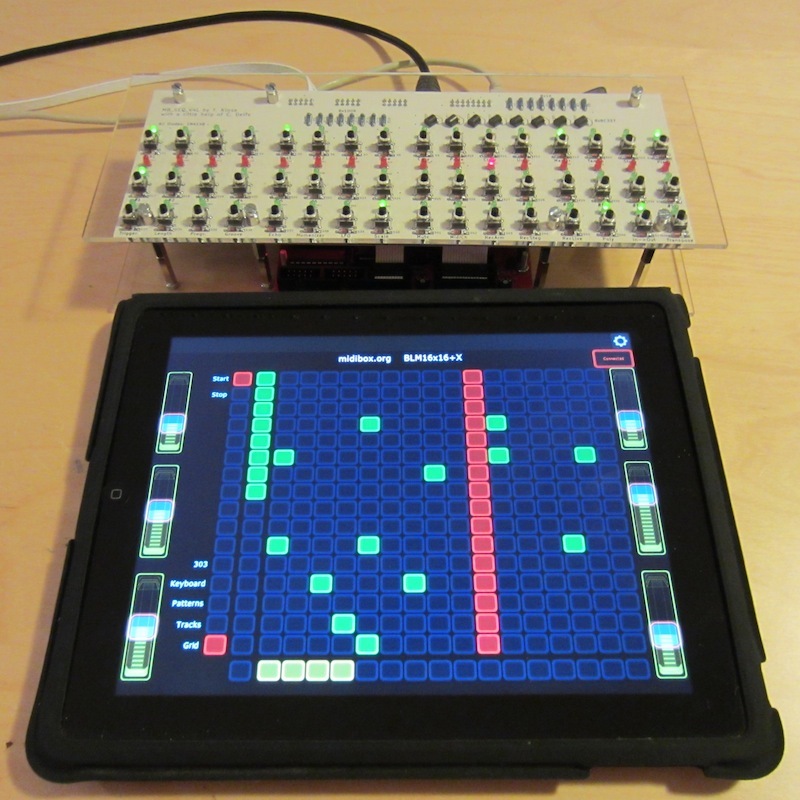 In distance to TouchOSC the controllers are fully programmable with an easy to learn script language. And in distance to OSC it's also possible to work with MIDI at low-level -> means: at bit basis (e.g. a MBSID Editor is feasible)! The user interface feels much better than the Juce implementation, and due to the easy to use Lemur Editor it's possible for everybody to customize the user interface! Now you are ready for having some Multitouch BLM fun! 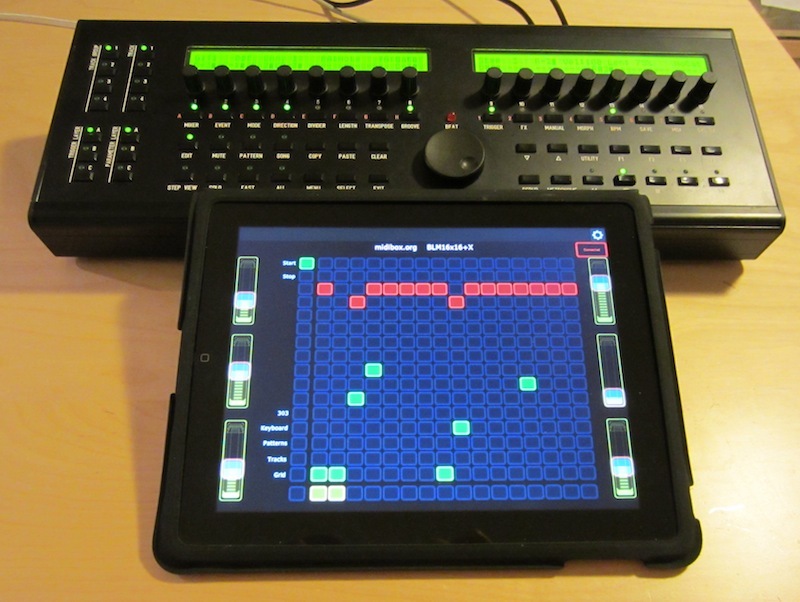 Update: with MBSEQV4L V4.055 the BLM is also supported by MIDIbox SEQ Lite! Sequences can be directly entered in Grid or 303 mode. 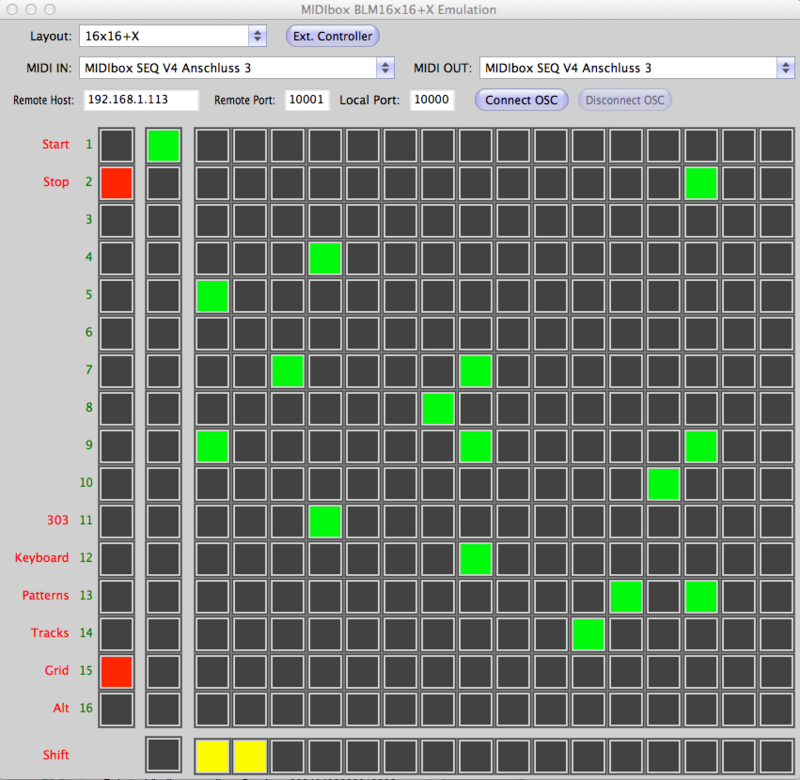 Patterns can be selected in a grid as well (like known from Ableton Live). The keyboard mode allows to play a synth directly, but can also be used for recording!